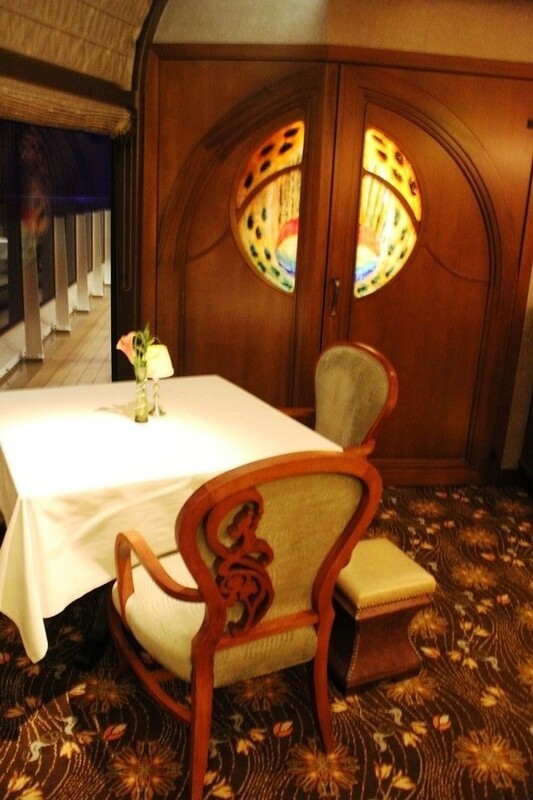 I want to tell you about my experience at Remy, the fine dining restaurant aboard the Disney Fantasy, which also has a sibling venue aboard the Disney Dream. There is no way to tell you about everything on the menu, and likely by the time you are onboard the menu will have changed as they are always playing with the local, freshest ingredients that the kitchen can get its hands on. What I do want to do today, however, is give you a good feeling of what to expect from Remy and give you the opportunity to decide if the meal is one you would enjoy or something that maybe isn’t quite right for you. Let’s start with you as a diner and the restaurant’s dress code. There is a dress code for Remy, which includes jackets and dress shirts for men, with ties being optional, and skirts, dresses, or a pantsuit for women. From my time onboard, and witnessing what some guests considered formal wear, you need to be prepared to dress up for this meal. Don’t come in under the impression that the dress code is more of a guideline and you can get away with dressing how you please because it is Disney. The dress code is slightly more relaxed at Palo, the other fine dining experience onboard, but I saw guests turned away from both establishments for failure to come appropriately attired. There are two other items that you should be prepared for walking in, that this is a refined experience that is going to take some time and that you have an adventurous palate, or an open mind about food at the very least. There are going to be multiple individuals that you have to interact with, such as the sommelier, various wait staff, and even a chef or two, and they will switch out your napkin with a fancy pair of tongs. Every luxury is considered, and it may take you a little while to get used to it. I know it was tricky for me not to be able to pull out my wife’s chair or to have someone consider the color of my suit and how a white napkin versus a black napkin would leave distinguishable lint. But if this is something you are used to, or something you can warm up to, you’ll be fine. Plus, everyone is incredibly friendly! As for that open mind about food I mentioned, let’s talk about the menu for a moment. There are two standard menus for Remy. Saveur, French for flavor, is the French menu constructed by Chef Arnaud Lallement, whose l’Assiette Champenoise is a 3-star Michelin restaurant just outside of Reims, France. Goût, French for taste, is the American menu assembled by Chef Scott Hunnel, a name recognizable to those who have ever dined at Victoria & Albert’s in Disney’s Grand Floridian. Both menus have five courses listed, with an assortment of other options provided in the menu should you decide to go off script and craft your own menu. While it may look like five courses, be prepared for surprises along the way. On the evening we dined at Remy the amuse-bouche was a foie gras foam served in a martini glass with slated caramel and macadamia nuts at the bottom, with the recommendation to pull your spoon all the way through so you get all the flavors. Sounds like something I definitely wouldn’t have ordered on my own, and that I would have stayed away from traditionally, but it was elegant and delicious. 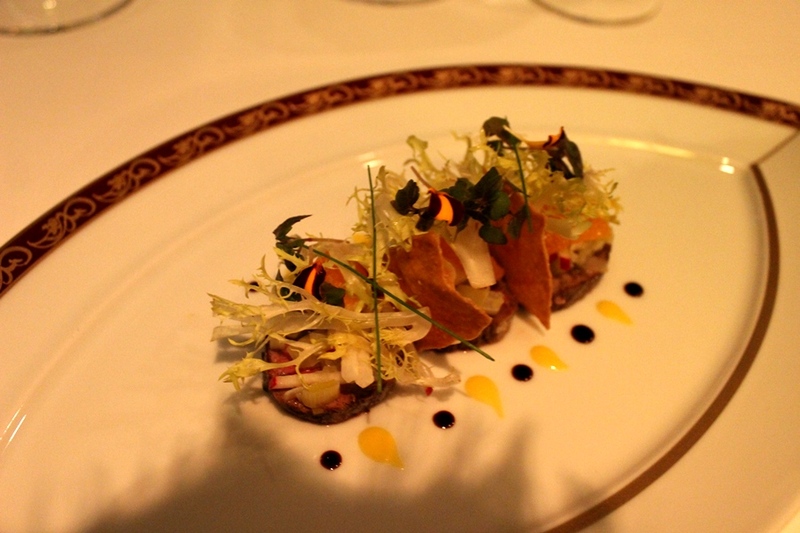 Again, it takes an open mind and palate to truly enjoy a dinner at Remy. Before we dive into some more of the menu offerings, let’s take a step back and admire the restaurant itself. The décor is filled with nods to Ratatouille, with the restaurant’s namesake character, Remy, making appearances in the chandeliers, on the back of chairs, and just about everywhere you can think of. 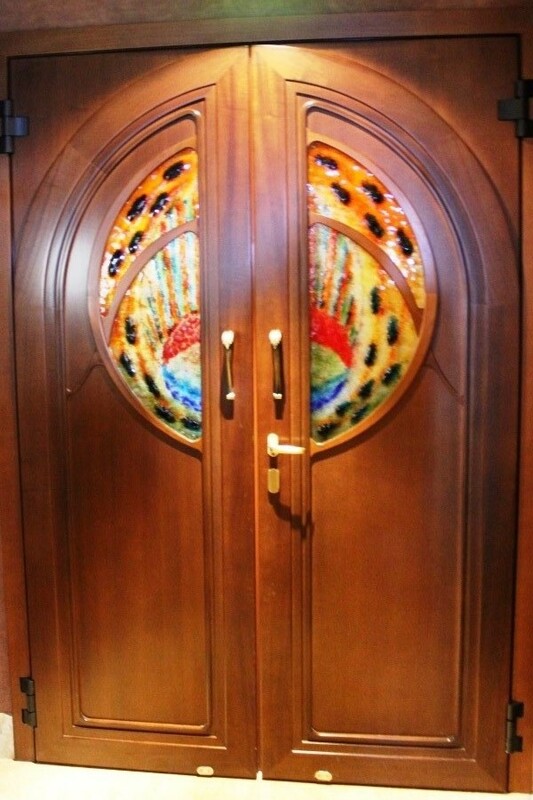 There are rich brown and green tones throughout the restaurant, with some wonderful pops of color on the doors throughout the restaurant. 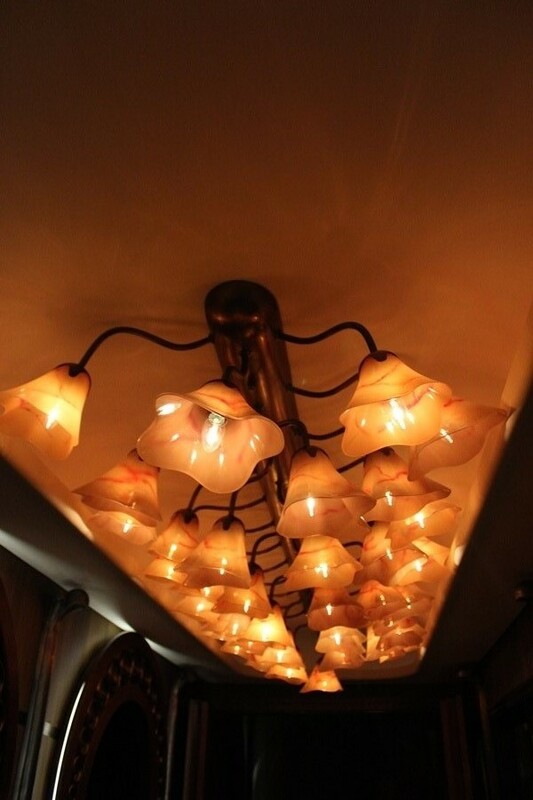 The lighting is warm and cozy, and it lulls you into wanting to lazily relax as you slowly make your way through your meal. The tables are not overly close to one another, so even if you’re not in a booth you definitely feel as if you have privacy, with hushed conversations just adding to the warmth vibe of the restaurant. You meal will open with the Colette Cocktail, again named for the character from Ratatouille. This is the second iteration of the cocktail which includes vodka and champagne. The vodka will remove the bubbles from the Taittinger, but fear not, the sugar released from the candied apricots will not only sweeten the cocktail, but return it to its effervescent state. Remy also has one of the most extensive wine collections you’ll find on the ship. The focus at Remy is on French wines, but there are also wines from other regions, including Lasseter Family Winery if you’re so inclined. If wine, and fine wine at that, is your thing, consider opting up to the wine pairing for your meal. Your waiter or waitress will then guide through the menu and take special care should you have a dietary concern. For instance, seafood of any kind and I just don’t get along, yet both menus feature a fish course. I was able to order a menu with a modified course, which we settled on a simple, yet elegant pasta with black truffle and cream sauce after much discussion, and carry on with the remainder of meal. They even went so far as to ensure that this was a food preference not an allergy, as there would be a fear of other items I could come into contact with from the kitchen. The main courses, regardless of which one we’re speaking of are out of this world. One the night we dined there was a smoked bison with fennel and leeks, as well as a Kobe beef with venison cheek and tarragon cubes, that to put not too fine a point on it, are probably two of the best dishes I’ve ever eaten. My wife had a similar reaction to her halibut, and this is in between other courses that definitely let you know you are in another realm of dining. As one Cast Member on the ship remarked to me, the tiniest detail that you and I wouldn’t notice in the plating makes all the difference to the team at Remy. Another of those surprise courses that you should prepare yourself for is when the cheese cart rolls your way. If you are a fan of cheese, as I am, this is going to totally send you into a state of nirvana. There are approximately 10-12 cheeses on the cart, alongside some wonderful accompaniments, and what you eat is completely up to you. If you’re more a fan of milder cheeses or the stronger bleus, you can opt to just stick to what you know. You can also leave yourself in the hands of your server, as we did, and end up with a plate that runs through the world of cheeses, starting with the mildest and building you up to the incredibly strong, yet delicious, Roquefort. Dessert is also a multi-course event at Remy. While there may be one listed on your menu, be prepared for tarts with interesting flavor pairings, small cakes, and lollipops to show up before the end of the meal. There may even be a few chocolates waiting for you in your stateroom when you return. 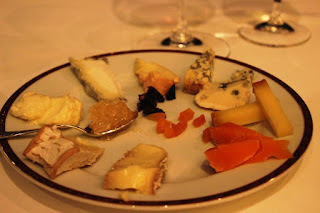 Some of it you can take with you, and makes a lovely last bite once you’ve left the ship, while others you’ll have to eat while at Remy. You may be feeling like a stuffed pig yourself by this point, but everything is well worth a nibble or two. A meal at Remy is going to take several hours, and the team there does nothing to make you feel rushed, so make sure you are able to devote as much time and care to the experience as you can. I promise you, you will get more out of the meal if you put forth the effort yourself. Which you should want to do anyway, as a meal at Remy is not cheap. In fact, it is arguably one of the most expensive meals I’ve ever had personally. And there are additional items you can add to your meal, such as caviar, water service, the aforementioned wine pairings, and Wagyu beef. It may be one of the most expensive meals I’ve ever been a part of, but every bite was worth it. As I wrap up this walk through of Remy I want to circle back to where we started. This isn’t a meal for everyone. There were points in my life that not only would the cost have been prohibitive, but the menu itself would have frightened and kept me away. You have to be open to the experience, open to try new things, flavors, and pairings you’ve never considered. However, if you enjoy fine dining, and the ambiance and formalities that come with it, Remy is an experience you’ll never forget. I certainly know I won’t forget my meal there anytime soon. I am so glad you enjoyed it. You know I love fine dining and we will always make time for this experience when on board but you are correct that it is not right for everyone. PS... they will provide the gentlemen with a jacket if you happen to forget. We rely on it because my husband has no jackets really and the ones they provide are nicer than any he would buy.